Are you planning to open a cafeteria or a coffee shop or a restaurant? 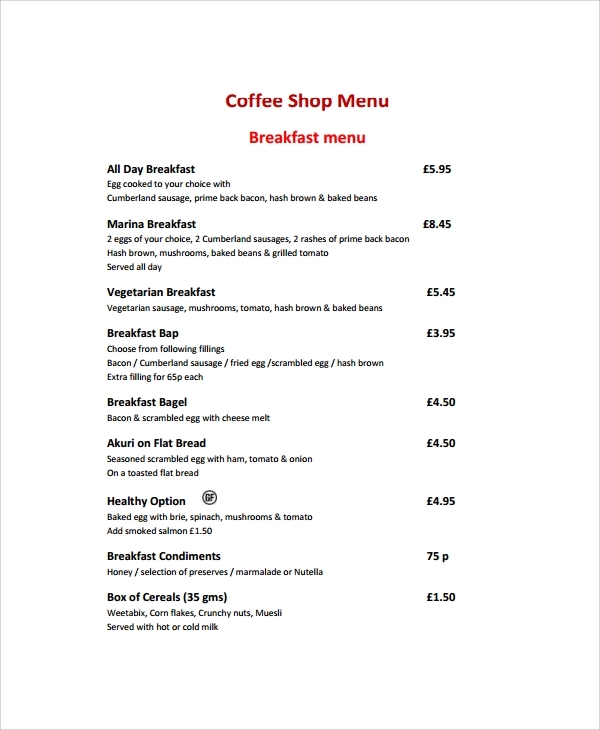 You will definitely require menu charts or menu leaflets. You will be required to invest money and get the charts and leaflets designed. Why wasting money? You can get free templates as per your choice easily. Sign in and get it done for your coffee shop. 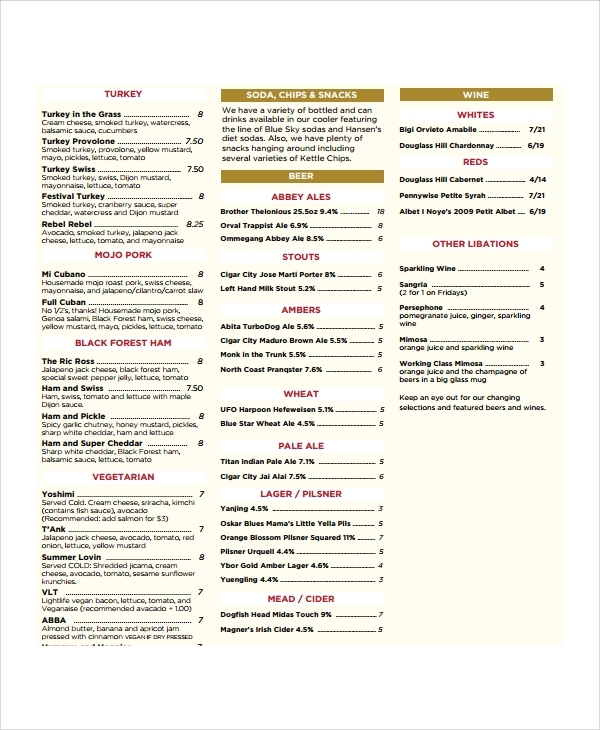 Our Menu Templates are colorful and well designed. 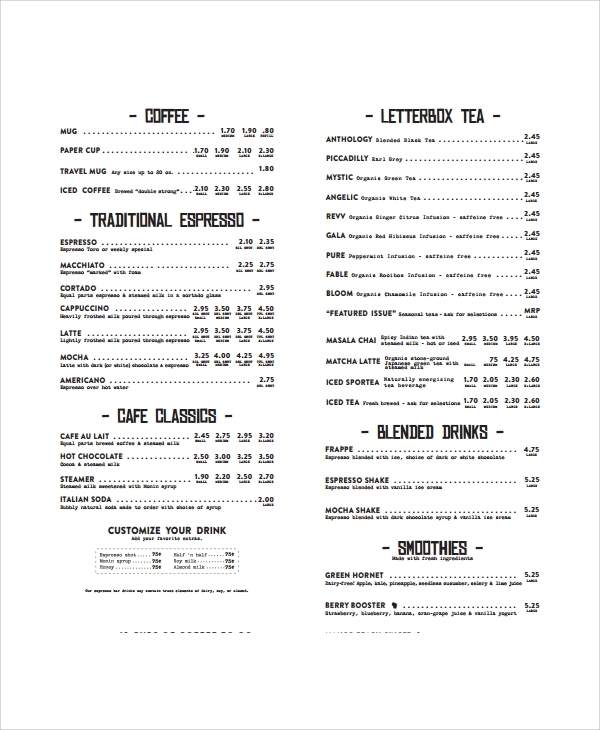 Cafe menu templates are ideal for people who are planning to arrange for coffee shop. This can include the snacks, the variety of coffee you want to offer, it will also include the price. The price you can divide in full plate and half plate format. You can mention about taxes and other details. Restaurant is mainly for food menu and you have to sort it accordingly. If you are providing Chinese, Indian, continental foods and other types of foods. You need to divide it accordingly and mention about the dishes their ingredients and their prices, here also you can mention the price in two forms for full plate and half plate. If you are an owner of bar you need to have a details of the drinks available- cocktail, mocktail, hard drinks, soft drinks,. In this you need to mention all the details for the price as per the shots and size of drinks and choice of drinks. 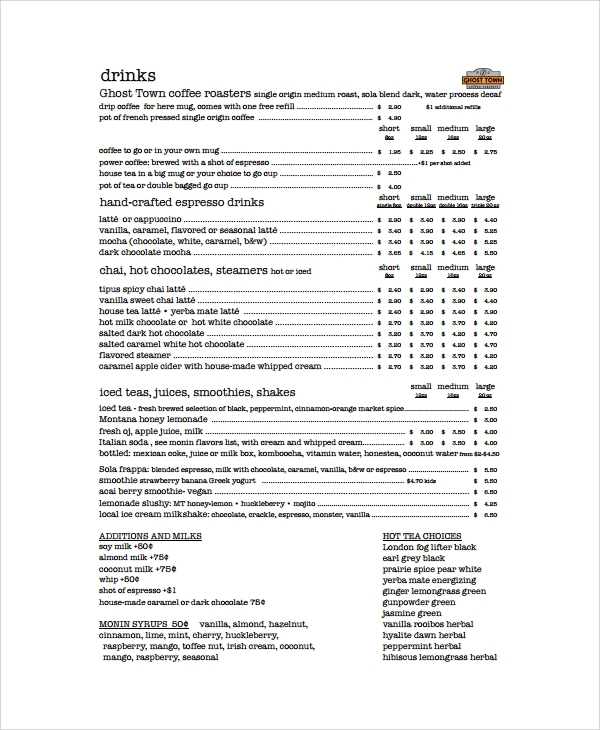 Why do I need Coffee Menu Template or Restaurant Menu Template? 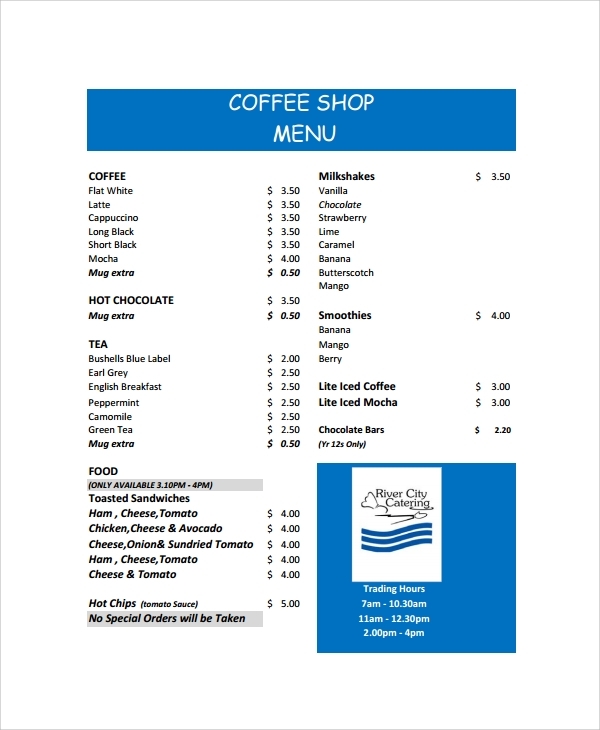 If you are planning to open a shop or snacks center or coffee shop you will definitely need to have menu printed for your customers to choose from. The menu sheet will have all the items you have and will also provide price chart accordingly to sort from. 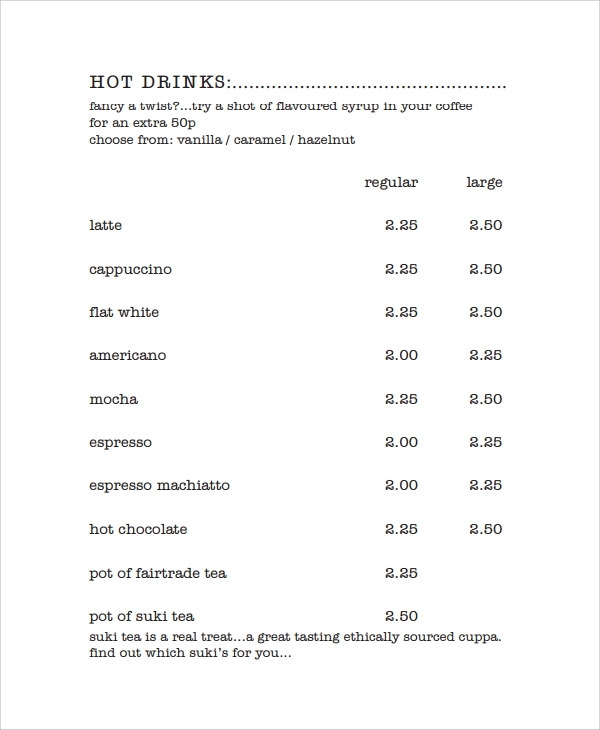 How to create/write Coffee Menu Template? 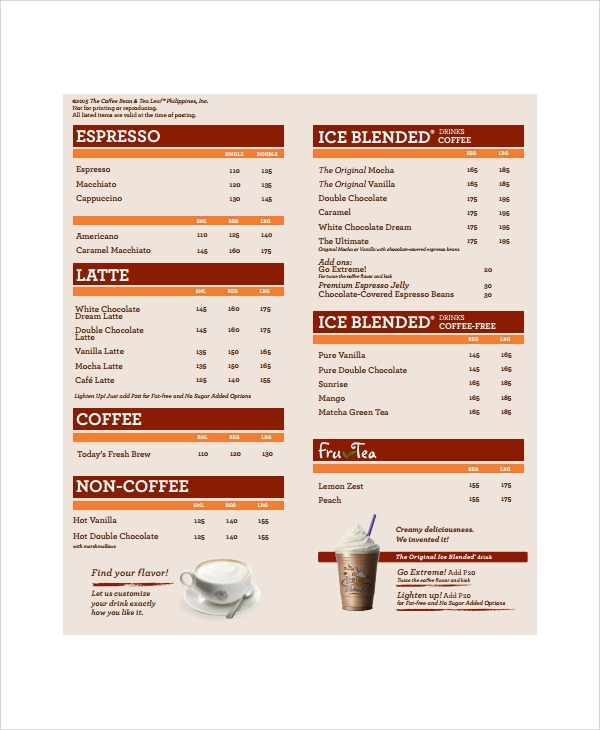 If you prefer a simple process to produce Coffee Menu Template, is usually vector format works for you. All you have to accomplish download the file then open file using illustrator software such Adobe. 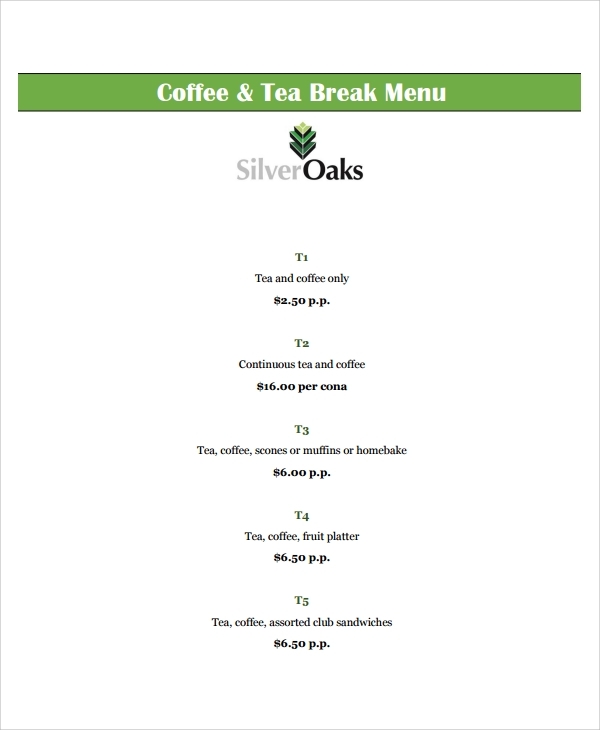 And you can replace the link inside the template along with you menu list for example coffee product plus the prices. Gray background with ornament of lines crossing their email list menu others you could find in internet. With lines that move through the coffee menu list, appears like the veins or lines which one can find naturally in coffee bean. Basic red colorization on the menu and price list to create visible the contrast between light and dark colours. 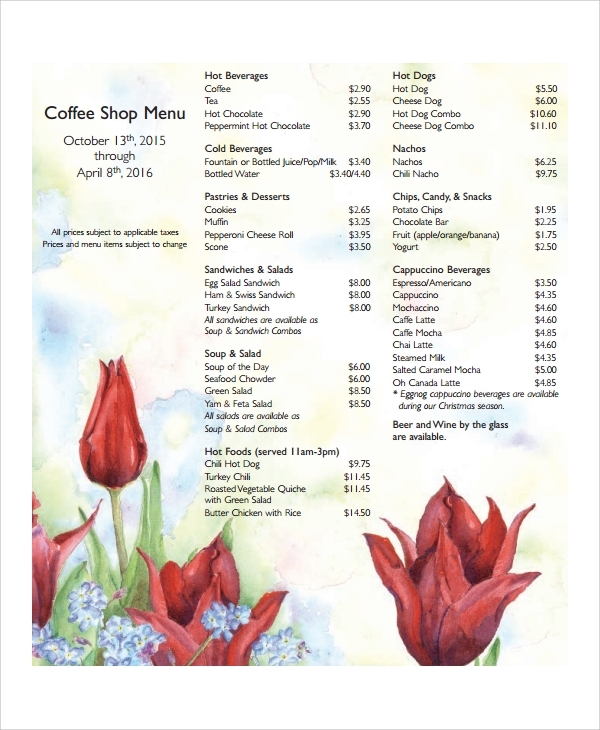 Restaurant menu or coffee menu are the best way to attract people to your shop or store and thus helps to make people understand that I is under their budget too. We have lot of menu templates keeping your requirement in mind. Please go through the various templates available and download the best one for yourself!